Christa Ebert, also known as Uno Lady, puts on a performance that needs to be seen to be believed. 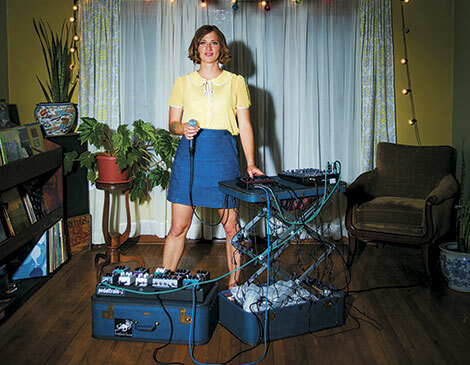 Whoever said you needed more than one person to form a band forgot to tell Christa Ebert. Performing under the moniker Uno Lady, this one-woman choir uses a microphone, small mixer and loop pedal perched on a podium to create an emotional musical experience. Each performance is a little bit different as Ebert, 35, uses her pedalboard to layer haunting melodies with syncopated beats on top of rich soundscapes to create her distinctly transportive music. With a record on the way this year, Ebert continues to create new sounds to entrance and mesmerize her audiences. My earliest memories are of singing. I remember trying to organize a concert on the playground in the third grade. I have no choice but to sing. It’s a part of me.Uno Lady is basically myself, but a fancier version. I have always wanted to be in a band, but it just wasn’t happening. So I started to create music on my own. At my first gig at Pat’s in the Flats in 2007, I sang into my computer alongside a projection of an old drug education film to have a visual element. I would describe Uno Lady as a one-woman ghost choir, lush layers, captivating, mesmerizing, always spinning you into a musical web.My process has definitely evolved over the years. I started with a laptop and a microphone and then built my first homemade podium with a space for my computer and my loop pedals so I could build songs live and the audience could see me create. Letting the audience see my process helps them get in the moment with me and be a part of a shared experience. Music is a way to connect with total strangers. It’s a way to find your tribe hundreds of miles from your home. I really appreciate when someone shares their attention and is open to experience the performance with me. It makes us feel like we’re in it together. Sometimes after the show, people will share that I reached them or inspired them to create their own music. During a show, I get caught up in the moment, lost in the music, and I’m part of that place and time where everything floats by. Ideally, I reach a good flow and nothing is going through my head except the music. But it took a lot of work and discipline to get to that space. I used to have intense stage fright. Nerves are proof that I am challenging myself, trying something new and growing as a person.